Big Boy – Tomato Town organically grows heirloom tomatoes in the greater Kansas City area as well as Johnson County, Leawood, Lenexa, Olathe, Shawnee, Merriam KS, Independence MO and Kansas City Missouri, KCMO. Varieties include: Cherokee Purple, Brandywine, Stupice, Carbon, Black Krim, Black Cherry, Yellow Pear, Absinthe and Aunt Ruby’s German Green. Farmer J spotted this tomato hornworm among the wilted ruin of frostbitten tomato plants this morning. 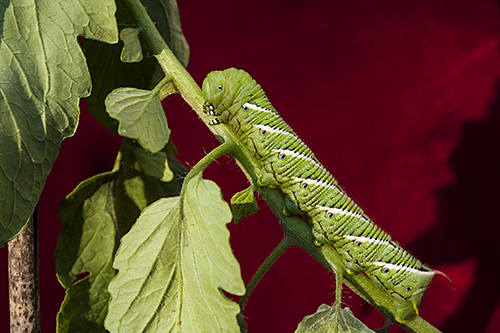 We’ve had infestations of tomato fruitworm, but never a monstrous beast like this one. It was difficult not to be impressed by its size and beauty. This specimen was well over two inches long, so it is clear he’s been in the neighborhood for awhile. This entry was posted on Sunday, October 7th, 2012 at 5:58 pm. It is filed under Creature Feature. You can follow any responses to this entry through the RSS 2.0 feed. DIE DIE DIE DIE DIE!!!! !